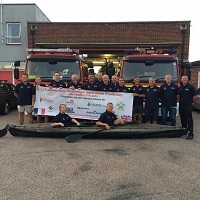 An intrepid team of 23 Hampshire firefighters are retracing the paddle strokes of the famous Cockleshell Heroes in an attempt to raise at least £10,000 for charity. The five-day mission will take them along the Gironde estuary through the treacherous water into Bordeaux making the same stops as the original British commandos who made the daring raid during WW2. The group will be welcomed by French firefighters and dignitaries as they travel the gruelling 90-mile journey in two-man kayaks. Only two of the 10 Southsea-based Cockleshell Heroes who took part in the operation survived after infiltrating Nazi-controlled Bordeaux and attaching mines to the hulls of German ships carrying war supplies. Operation Frankton was considered one of the most daring operations of the war and Winston Churchill said it shortened the conflict by six months. Watch Manager Mark Pannell said: “This has been 18 months in the planning and it will be an incredible experience that will do a lot for causes that are very close to our hearts. “It will test all of our physical and mental resolve to recreate and complete the 90-mile journey. “We will follow and stop off at the same points along the route of the original mission and bring the history alive. “We are using the modern equivalent of the kayaks the marines used which has made it very real for everyone and I think this trip is extremely poignant for anyone who grew up in the area. The Cockleshell Challenge Frankton Paddle 2016 will start on Sunday at 7.30am from La Verdon in the mouth of the Gironde Estuary and finish at Blanquefort, Bordeaux on September 15. Money raised will be split between The Fire Fighters Charity, the Royal Marines Charitable Trust Fund, the Royal National Lifeboat Institution (RNLI) and the Special Boat Service Association. The team have already collected more than half their target and hope to raise the rest with an online appeal on the Virgin Money Giving site.